Maharani Ahilya Bai Holkar (31 May 1725 – 13 August 1795) was the Holkar Queen of the Maratha ruled Malwa kingdom, India. Rajmata Ahilyabai was born in the village of Chondi in Jamkhed, Ahmednagar, Maharashtra. She moved the capital to Maheshwar south of Indore on the Narmada River. Ahilyabai's husband Khanderao Holkar was killed in the battle of Kumbher in 1754. Twelve years later, her father-in-law, Malhar Rao Holkar, died. A year after that she was crowned as the queen of the Malwa kingdom. She tried to protect her kingdom from plundering Muslim invaders. She personally led armies into battle. 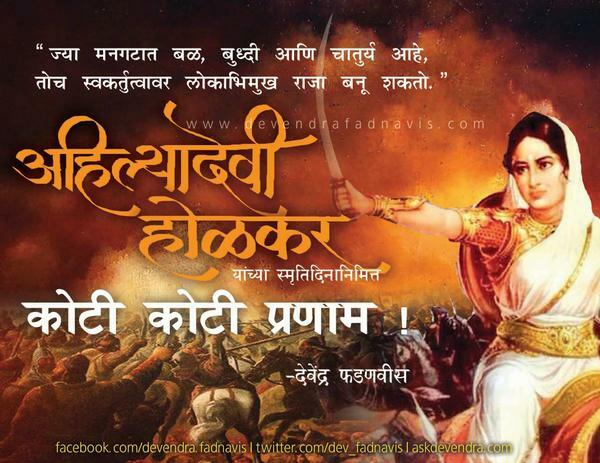 She appointed Tukojirao Holkar as the Chief of Army.